The most popular way to get started in beekeeping is with package bees. The bees arrive in a ventilated moving box with a small can of food. A package of bees will contain about 10,000 bees. This small sized colony is easier for new beekeepers to handle. And, packages are readily available in early Spring. One disadvantage of buying a package of bees is the fact that they begin with nothing. They have to difficult job of building all their comb from scratch. However, this can also be an advantage. The beekeeper avoids the risk of contaminated comb. When to Order Package Bees? The lucky new beekeeper may find bees for sale in late Spring. But to be assured of getting bees, you should order your package bees in late Winter or very early Spring. This is the time of year when bee suppliers are producing bees for sale. Italian bees are the most popular race but other types of bees are available too. Once package season is over, you will have to wait until next year. Or perhaps, find a beekeeper who is selling a whole hive of bees. This is a good method for getting started. But, it would be more expensive and more difficult for beginners to manage. Of course, you can use other things but a J hook hive tool is very useful to any beekeeper. 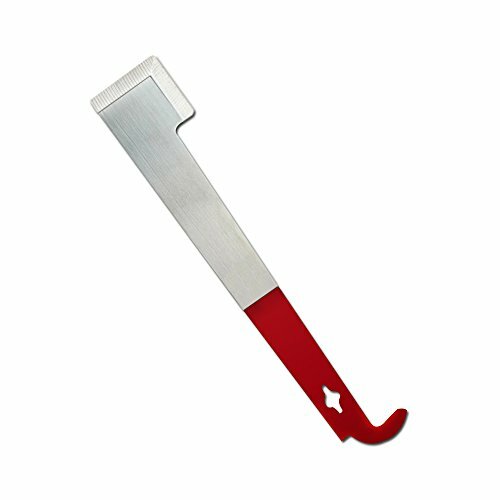 They are my favorite hive tool and I highly recommend you give one a try. Your package bees may arrive via the post office. But lucky beekeepers have the option of picking up their bees at a local supplier. This reduces stress on the honey bees because they spend less time in travel. Your bees have already been through an adventure – even before they make it to you. Large bee producers shake bees into packages for sale and add a new queen. The package boxes receive a can of syrup to sustain them on their journey. Then, they are loaded into trucks and travel to the point of sale (your local supplier) or your home via post. If you are picking up package bees, plan to arrive early. This will be a very busy time with many excited beekeepers running to and fro. When you receive your package, do not be concerned about a few dead bees in the bottom of the box. This is normal as some bees die every day. Our natural tendency is to want to keep the bees warm. If the temperature is over 40F, don’t be concerned with heat. Package bees are at a greater risk of over-heating. 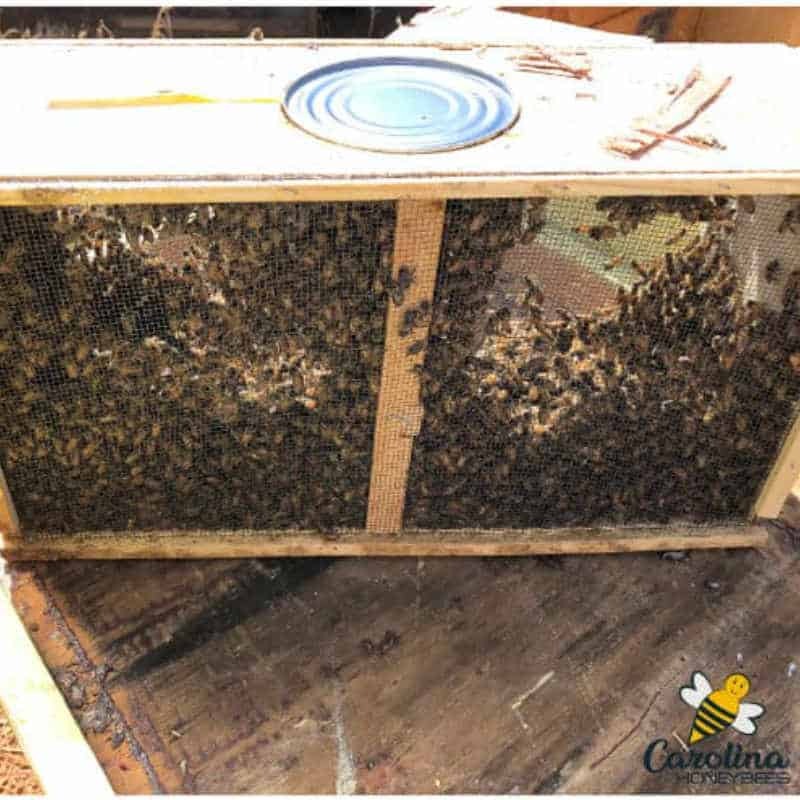 Your honey bees have no way to cool themselves while clustered in the box. Keep them cool, in a well-ventilated location on the way home. Don’t stop for lunch and leave them locked inside a hot trunk. Trying to decide when to install your package bees? Honestly, there is no perfect time. The bees should be put into the hive as soon as possible. Installing them on the day that you receive them is best. They can not begin to construct comb and develop their colony until then. As for time of day, some beekeepers advocate waiting until late afternoon. The idea is that the bees will have overnight to settle in and result in fewer lost bees. Personally, I install my package bees as soon as I get home with them. I have not had any problems with this method. Once you arrive home with your bees, place them in a shady location. Ensure that your equipment is in place and you have the tools needed to finish the job. To install your package, I suggest you suit up. Have your hive tool and any other items you wish to use – with you in the bee yard. You should not need a smoker. Package bees are confused and lost but less likely to sting. They have no home to defend but they will sting if provoked. Wear protection. The queen bee that you receive with your bees is not “their” queen. She came from a mating nucleus and need to be gradually introduce to your bee family. She travels in a special queen cage (there are several types) with a few attendants that are known to her. The white “queen candy” serves as food but also a temporary barrier between her and the other bees. Some bee suppliers make the job of getting to the queen harder than it should be. Our first task is to remove the can of syrup and the queen cage from the package bees. After removing the cork from the candy plug end of the queen cage, we hang the cage inside the hive. If you have added any frames of brood to the box (from another colony), she can be placed near them. One method of getting the rest of the package bees into the hive is to place the transportation box in the hive. And, let the bees move on their own schedule. This is okay but it requires another trip to the hive on the next day. The cage must be removed and frames replaced in the empty spot. Rarely, the bees don’t leave the box and the queen hanging in her cage will die. There are several ways to move your bees from the traveling box to the hive. Choose the method that sounds best to you. I prefer the method of shaking package bees into the hive. While it may seem a bit violent, I think it causes less stress on the colony. Once they are secure inside the hive, I leave and do not disturb them again for several days. I do not have to revisit the hive and remove the box. Don’t worry about getting every single bee out of the box. When most of the bee are free, sit the box down near the front of the hive. Most of the bees will join their sisters in the hive before dark. The bees are arriving in their new home with no resources. Most hives will benefit from feeding until the colony is established. In some regions, feeding package bees is mandatory for growth. At the minimum, have a plan to feed your new hive for several weeks. See this post for ideas on how and why you should feed your package. You do not need a smoker when installing a package. I was lighting my smoker because I took some frames of brood from a very strong colony. This gives my new package a boost. Once your bees are installed in the hive and fed, it is time to leave them for a while. Over the next 3 – 5 days, the queen is released and hopefully accepted by the hive. Then, you can remove the queen cage and push your frames close together. Keep your bees fed and check again in a few more days for eggs. 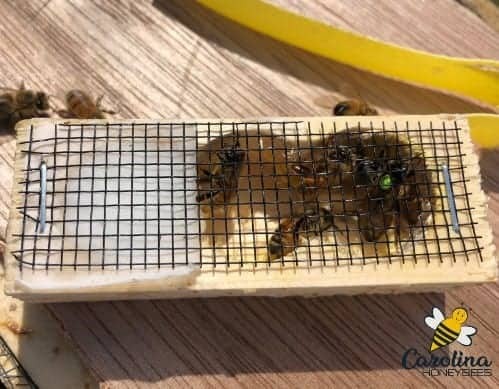 When you have verified the acceptance of a queen with a good laying pattern, your hive is ready to grow. Continue to monitor them for growth, pest control etc.